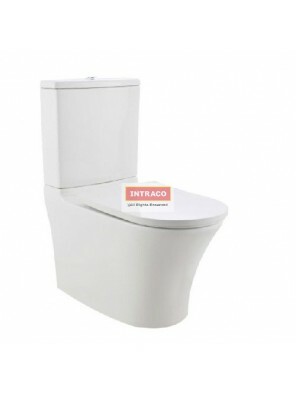 COMPLETE SET FOR TREVISO DUAL OUTLET 4.5/3L C/COUPLED WC SET (RIMLESS)(WHITE)P-TRAP HO:185MM.. 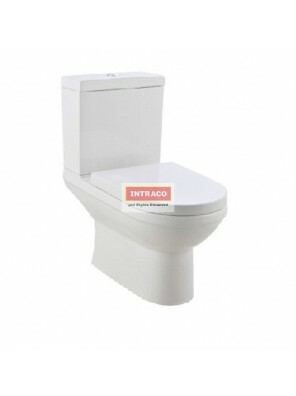 COMPLETE SET FOR TREVISO DUAL OUTLET 4.5/3L C/COUPLED WC SET (RIMLESS)(WHITE)S-TRAP BO:300MM.. 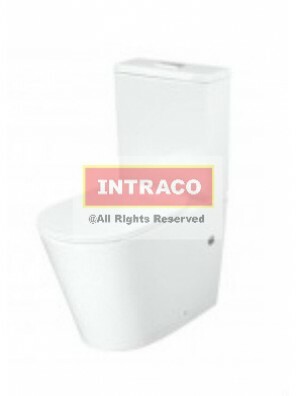 COMPLETE SET FOR TREVISO DUAL OUTLET 4.5/3L C/COUPLED WC SET (RIMLESS)(WHITE)S-TRAP BO:250MM.. 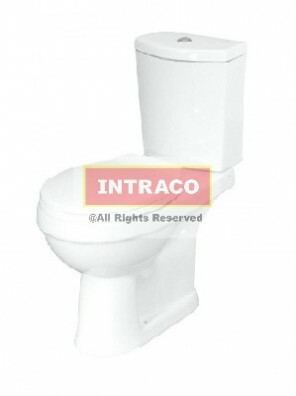 COMPLETE SET FOR TREVISO DUAL OUTLET 4.5/3L C/COUPLED WC SET (RIMLESS)(WHITE)S-TRAP BO:200MM.. 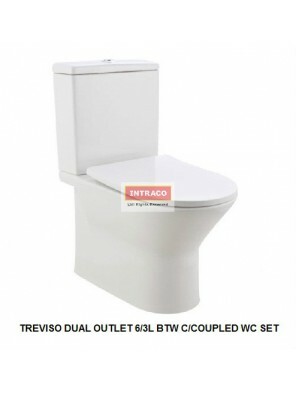 COMPLETE SET FOR TREVISO DUAL OUTLET 6/3L BTW C/COUPLED WC SET (RIMLESS)(WHITE)S-TRAP BO:200MM.. COMPLETE SET FOR TREVISO DUAL OUTLET 6/3L BTW C/COUPLED WC SET (RIMLESS)(WHITE)P-TRAP HO:180MM.. 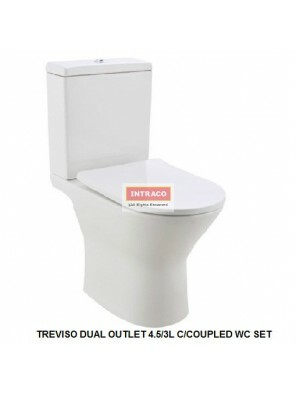 COMPLETE SET FOR TREVISO DUAL OUTLET 6/3L BTW C/COUPLED WC SET (RIMLESS)(WHITE)S-TRAP BO:250MM.. COMPLETE SET FOR TURIN DUAL OUTLET 6/3L CLOSE COUPLED WC SET (WHITE)-S-TRAP BO:200MM.. COMPLETE SET FOR TURIN DUAL OUTLET 6/3L CLOSE COUPLED WC SET (WHITE)-S-TRAP BO:300MM.. COMPLETE SET FOR TURIN DUAL OUTLET 6/3L CLOSE COUPLED WC SET (WHITE)-S-TRAP BO:250MM.. COMPLETE SET FOR TURIN DUAL OUTLET 6/3L CLOSE COUPLED WC SET (WHITE)-P-TRAP HO:180MM.. COMPLETE SET FOR VICENZA DUAL OUTLET 6/3L BTW C/COUPLED WC SET (SIMLESS)(WHITE)P-TRAP HO:185MM.. COMPLETE SET FOR VICENZA DUAL OUTLET 6/3L BTW C/COUPLED WC SET (SIMLESS)(WHITE)S-TRAP BO:200MM..
Riga C/C WC BO=150-250mm; 3/6L W UT1019 UF S/Close S/Coer "S" Trap (WH)..
Riga C/C WC HO=180mm; 3/6L W UT1019 UF S/Close S/Coer "P" Trap (WH)..
Smart C/C WC BO=250mm; 3/6L c/w Ws3580 PP S/Close, S/Cover "S" Trap (White)..
Smart C/C WC HO=180mm; 3/6L c/w Ws3580 PP S/Close, S/Cover "P" Trap (White)..